the everyday atelier: Is It Still A Koons if His Assistant Painted It? Is It Still A Koons if His Assistant Painted It? What an interesting article from The Wall Street Journal, "The Art Assembly Line", on the increased use of assistants in the studios of contemporary artists. The article mentions that the use of assistants has been a very common practice in visual arts since the Renaissance. 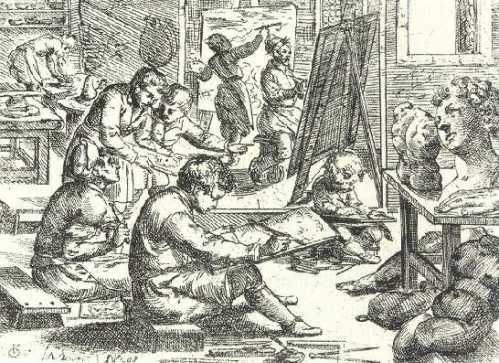 Apprenticing to your master was a way to develop skills and the master artist would employ assistants to do the time consuming things (ie: prepping a ground or painting the under painting) coming in later on the more important elements. It was an extremely common practice used by Michelangelo, Da Vinci, Rembrandt etc.. and did not de-value the work of the artist or his reputation in any way. In fact, it had the double benefit of elevating the status of the apprentice while helping the studio churn out the maximum amount of work to appease the patron. Assistants might also be used as technical adviser's in areas where the artist may not have as much experience, such as plaster casting. During Impressionism and beyond, the artist's hand became this sacred and valuable thing and all of a sudden Manet's grocery list is fished out of his garbage and sold for millions (not an actual fact, but not far off!). Now, contemporary artists like Jeff Koons and Alexander Gorlizki have returned to using assistants all the time for the same reason as the Renaissance Masters; little time to meet much demand. Look at Warhol and his Factory! Say what you will, but what makes Warhol a modern master is his intelligent play on the myth of the Artist as God or as Genius or as Icon. Does it make the work any less valuable? I would say not. If I could afford an assistant, I would certainly use one! I hate prepping canvasses. And if I could afford a Warhol, I would certainly buy one whether or not he actually touched the canvas! Now in the case of assistants creating artwork in the name of the artist after they've died...something about that seems immoral. I suppose Sarah Burton makes dresses under the McQueen label, but fashion houses are different and it is still Sarah Burton for McQueen. Her dresses are still her own vision--yes, obviously inspired by and influenced by her experiences with Alexander-- but her own regardless. And this is the nature of what happens. Assistants become Masters in their own right. (Consider the career of Jean-Michel Basquiat and his working relationship with Warhol) The cycle continues as they end up taking on their own assistants to meet the demands of their popularity. As much as people would like the art world and the artistic process to be this sacred,ethical thing, most of the time it is just not. It is a business and a political game and it always has been. Does the assistant concept work the same way in music or dance or theatre? One could argue, no. Unlike a canvas or sculpture, the musician or dancer is "the product" and no one can really take the place of that individual and do the work in the same way. Hence the Milli Vanilli lip-synch scandal or how people get so uptight about the use of body doubles in film. Julia Robert's body shots in Pretty Woman? Not her. Oddly though, no one seemed to mind as much about that as they do in the visual arts world. An interesting discussion. Thanks Wall Street Journal. What do you think? I saw the sol Lewitt film recently (Wall Drawings) and he created elaborate instructions and plans to be carried out by assistants/students. He was the composer and they were the musicians. You would love the film. There are some cases where it works and some where it just seems lazy/capitalist. I think when we all get up in arms about it we are really expressing our dislike for the art of "ideas" and "concepts". This also made me think of the Exit Through the Gift Shop documentary. That guy doesn't do any of his own art and never really has from what I understand. He just has ideas and then hires somebody to make it. That's what the movie starts out as! But halfway through they trade places and it turns into a doc about the guy who started making the doc who decided to become an artist. He is the one who hires people to make art, but never created any of it himself, other than some of the graffiti art he started out doing.